Power Output: 200W - Left 100W. Right 100W. It’s a monster when it comes to output. As you turn up the volume you will notice the bass gettng stronger and the treble sharper. All this power is balanced perfectly. 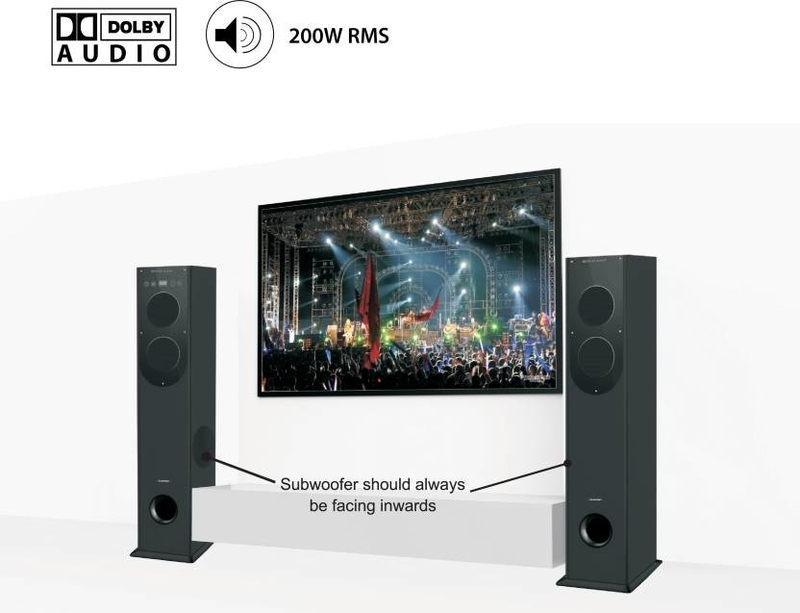 Dolby Audio is the upper level of sound technology. It is a promise that delivers full, rich and clear outputs across all wave lengths and volumes. Bluetooth, USB, AUX, RCA, OPTICAL, Coaxial and HDMI ARC. All the connecton optons are there. Just choose a device and you will be pouring out great volumes of music in seconds. Easy to use and very precise these touch controls give you access to all functions. Combined with the remote you have total power over the sound. Here we are talking about the delivery of mega bass. The thump pours out of these vents and you feel it go right through you. That’s a combination designed to give you crystal clear sound at very high volumes. The tech here is perfectly balanced to enrich music across all frequencies. Brilliant design where the built in air vent allows the unrestricted expansion of sound waves. The result is crisper sound with near zero distortion. Not only do you get information about what’s playing it also looks fantastic. The display is bright so you will not have to dim the lights to enjoy the effect. This is your command station. From here you can control each and every function. Bass, treble, balance, source…. Everything. It gives you full control and more convenience to listen to your tunes.